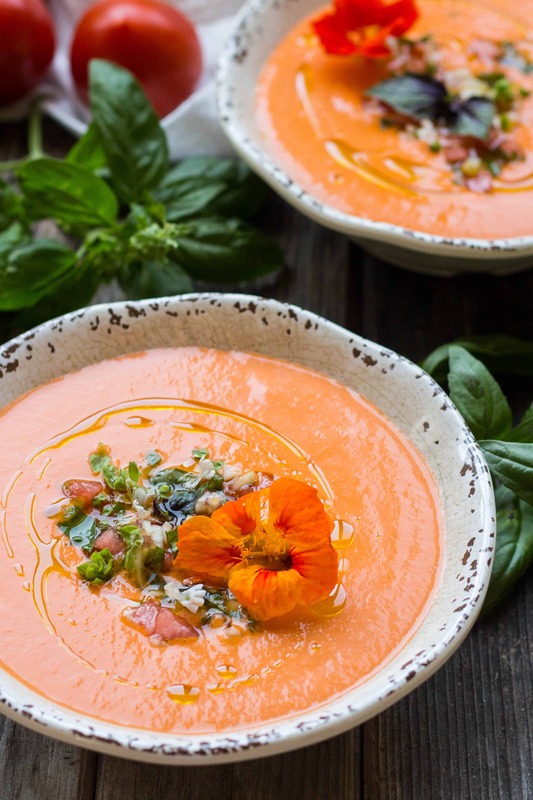 This easy recipe for Watermelon Gazpacho naturally vegan, silky smooth, perfectly balanced, andinsanely delicious on a hot summer day! It’s been a little weird not having a kitchen. But, honestly, not as weird as I had expected. Actually, it’s been kinda fun. Well, we’re not living completely kitchenless. That wasn’t an option. We need to at least be able to make coffee in the morning. So I created a mini-kitchen, of sorts, in the living room. We stuck the fridge in a corner, and next to it, a table with all the essentials: a cutting board, my knives, a French press, a tea pot, a toaster oven, a Nutribullet, and even a hot plate that doubles as a turn table when the sun goes down. Ok, maybe not, but wouldn’t that be dope? So, rather than eating a combination of cold cereal and takeout for the next few weeks, I’ve taken this on as a challenge. What sorts of flavorful and photogenic foods can I create in this little corner of my living room? So far, there have been lots. Like this gazpacho. That’s what I used to think growing up. 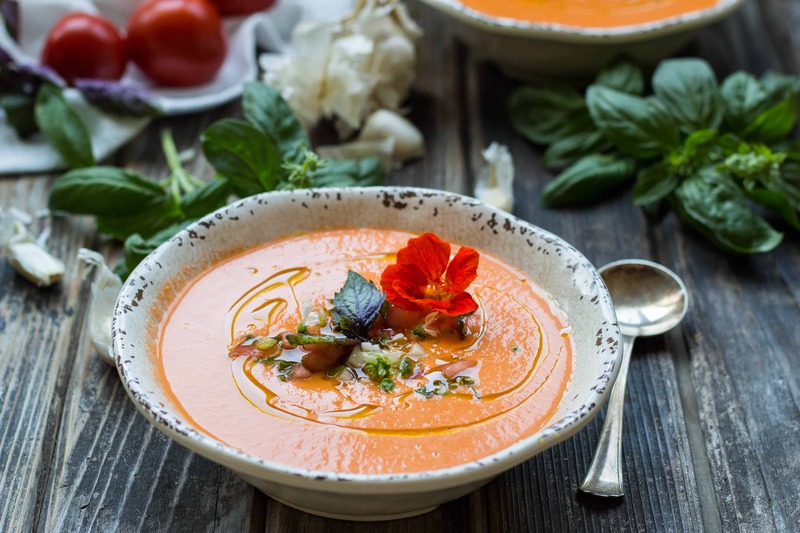 Gazpacho is a classic, and I’ve been well aware of it for a long time. But I never understood the concept. Everything about it seemed so unappealing. I imagined sitting down and eating a bowl of crappy jarred salsa with a spoon. No, thanks. I’ve often heard gazpacho described as a “blended salad,” as if that’s somehow supposed to make it sound more appealing. I prefer my salads in their whole, unblended state, thank you very much. Save the already been chewed foods for baby birds. But then a few years ago, I couldn’t seem to get away from gazpacho. 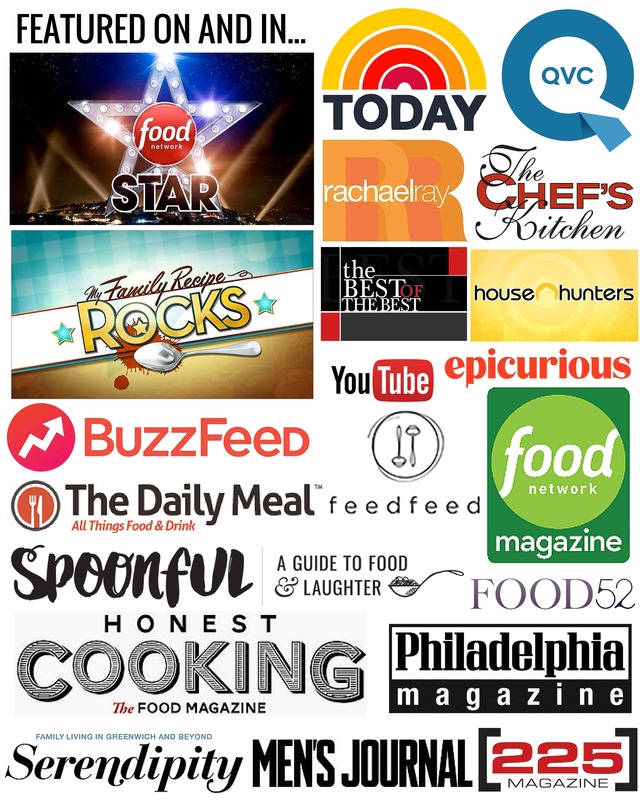 Colorful variations started showing up in magazines, food blogs, and on the menus of my favorite restaurants. I started to feel as though I was missing out on something. And that’s not a feeling I like. So, I gave it a chance. And from the first spoonful, to my utter shock and amazement, I was smitten. Like, licking the bowl smitten. There’s a whole world of tangy, refreshing cold soups out there, and all this time I’ve been ignorantly depriving myself of them. What a mistake! I needed to make up for lost time fast. So I started experimenting in my kitchen with these, er, blended salads, and I figured out what I like best. I’m more of a traditionalist, preferring smooth, creamy gazpachos over those with a more salsa like consistency. This is achieved by using olive oil and stale bread that’s been soaked in water to emulsify. I like a little bite in the back of the throat from sherry vinegar. I like a little heat. I like basil. And I like a little nudge from the watermelon. It brings just a touch of sweetness to the party, and totally ups the refreshment factor. What makes this particular bowl so special is that I made it with all yellow ingredients. I had yellow tomatoes (ok, and one green guy snuck in there), a yellow watermelon, and even these yellow cucumbers that mysteriously appeared in my garden. They didn’t kill me (yet), so I think they’re fine. But all together, they produced one happy bowl of yellow soup. The cool thing is, you can use whatever color produce you fancy, and you’ll still get one gorgeous and delicious bowl of gazpacho. With just this recipe, I’ve been able to create soups three different hues. It’s like a traffic light of cold soups, and all three colors are screaming “GO!”. It’s September, which means the tomatoes, the cukes, and even the watermelon are all still in their prime. And the fact that it’s been hotter this week than it was the entire month of August gives you even more reason to make a batch. I poured mine into a big mason jar, took it to the beach, and drank it like a smoothie. There’s really nothing better on a hot summer day. And guess what? It’s still summer for another 3 weeks. All I’m sayin’ is give gazpacho (and peace!) a chance. You might just fall in love. 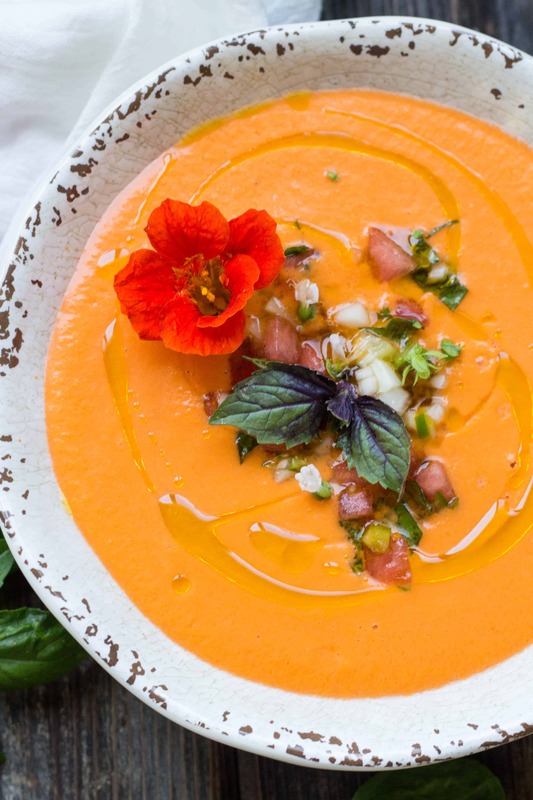 This gazpacho is velvety, tangy and super refreshing. The additional garnish of watermelon and cucumber chunks adds great texture, and a little heat from the serrano chile. I had some long hot peppers in the fridge that had been fried in olive oil a few days earlier. We drizzled that oil over the top for even more heat, and it was bomb. But a drizzle of good old fashioned extra virgin never goes out of style. Once cooled, peel the skins, then slice in half crosswise and remove the seeds, reserving them in a bowl. Cut tomatoes into chunks, then add to a blender. Mix the bread cubes with the tomato juice/seeds, then allow them to soak while you prepare the other ingredients. Add cucumber, watermelon, onion, garlic, sherry vinegar, salt, and olive oil to the blender. Squeeze out excess liquid from the bread and add to the blender, then blend on high for several minutes until you reach a smooth, creamy texture. Taste for seasoning, and adjust as needed. 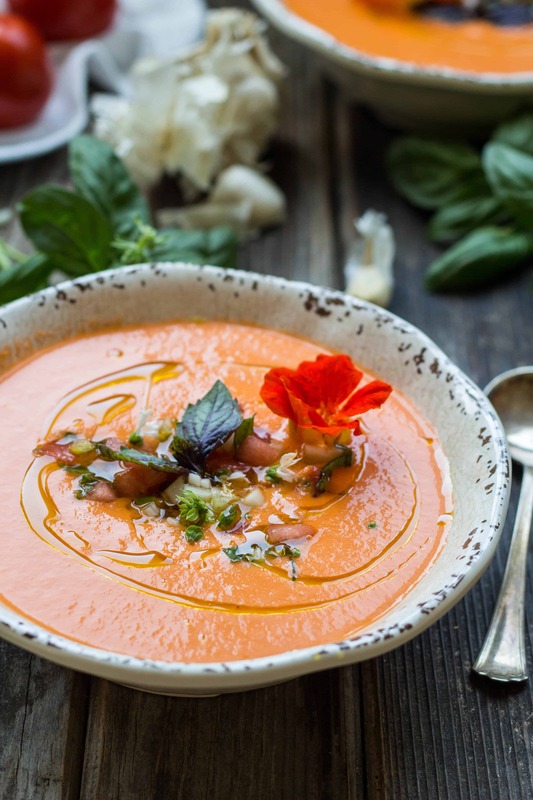 Chill the gazpacho for a minimum of 30 minutes so that all the flavors can meld together, and it gets nice and cold. Make the garnish right before serving. Mix together watermelon, cucumber, serrano chile, salt, olive oil, and basil in a small bowl. Pour the chilled gazpacho into a bowl, then top with a spoonful of the garnish. Drizzle with more olive oil, and serve. *The amount of vinegar will ultimately depend on the acidity of your tomatoes, the brand of vinegar, and personal taste. Always start small, taste, and add more as needed. **I usually don't go through the trouble of peeling tomatoes for many recipes, but I do for this one. I like the finished product to be super smooth, and the skins prevent that from happening. It's really just a textural issue, so if you're pressed for time and don't care about tomato skin floaters, skip it. Who stole your kitchen? I told you New Jersey was full of thieves…. 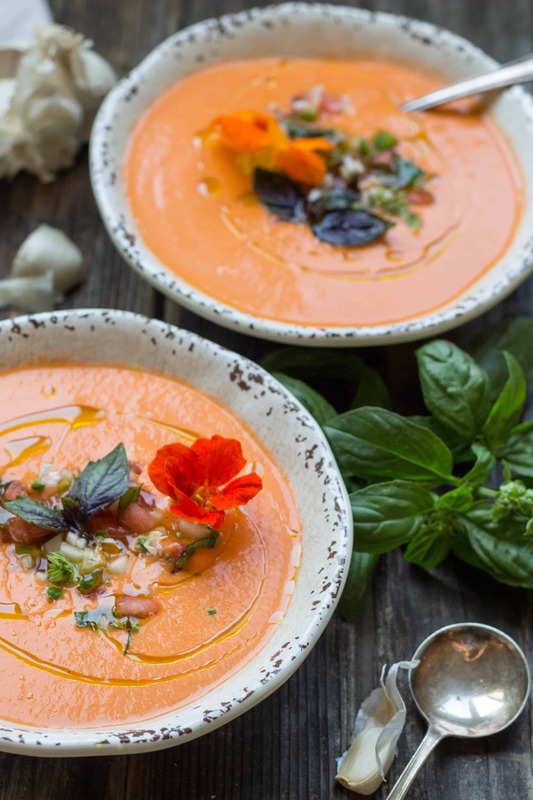 Love this gazpacho! 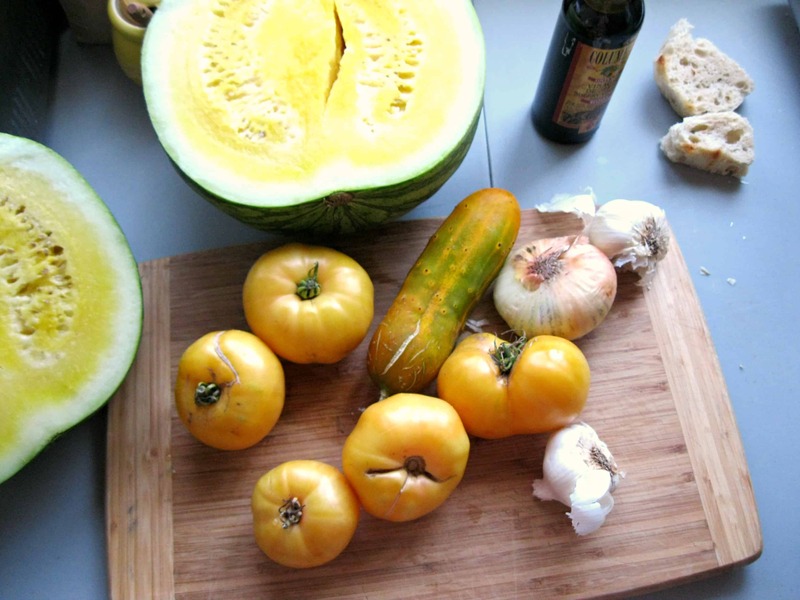 I love making gazpacho, especially in the summer – but i never have tried making a watermelon version before. thanks for the idea! Thanks, Thalia! It’s so refreshing and delicious. Im sure you’d love it!